The candidates should be a permanent resident of J&K State. 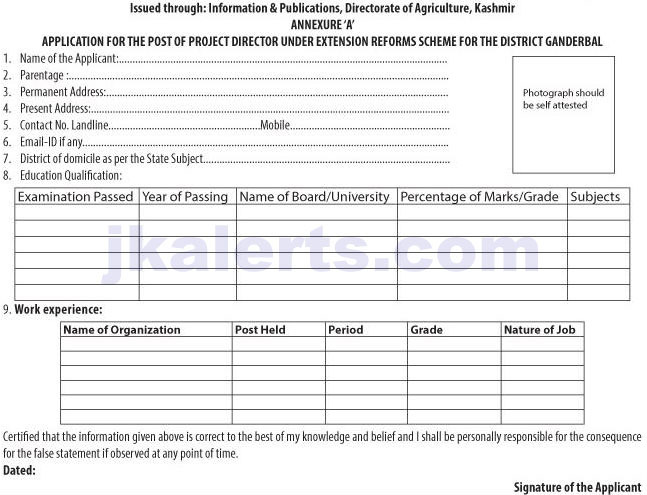 The candidate who belongs to District Ganderbal can only apply for the engagement on the said contractual posts. Selected candidates shall have to work on contractual basis and shall not claim any permanent employment on the said post. The period of contract shall be for one year& can be extended depending upon the continuation of the scheme and performance of the selected candidates. The engagement is subject to availability of funds under the scheme. The services of the selected candidates can be terminated at any time if the work and conduct Is not found satisfactory during the engagement. The contract shall deem to have been cancelled/terminated once the scheme is withdrawn by the Government. The contractual engagement of candidates shall cease to exist on attaining the age of 65 years in respect of already served Government employees. The selection committee shall have the right to accept or reject any application without assigning any reason thereof.